The Las Vegas Metropolitan Police have recently released bodycam footage from the deadliest mass shooting massacre in U.S. history, which occurred on October 1st, 2017, at the Route 91 Harvest Festival outside the Mandalay Bay hotel. The mass shooting was said to be conducted by Stephen Paddock as a single gunman up in his Mandalay Bay suite, which killed 58 people and injured 851 more. 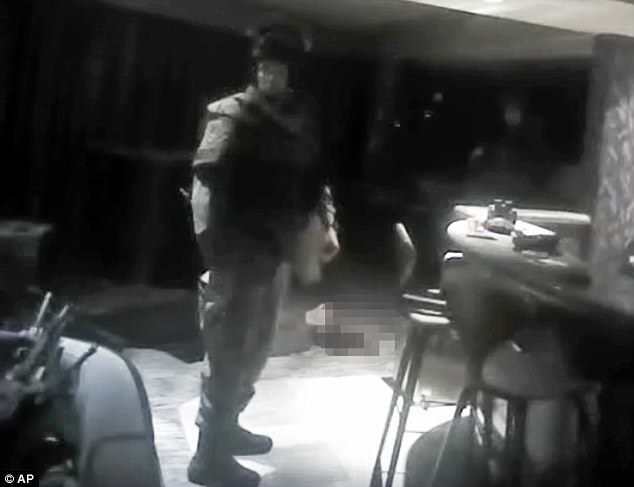 The Las Vegas Police force have released the footage which shows armed authorities entering into the 32nd floor hotel room suite after the suspect had already shot himself, however, they say that you won’t be able to see the first person into the hotel suite, since their bodycam wasn’t working at the time, because he didn’t activate his body worn camera. This might be seen by some people as being suspicious. In fact, that disclosure stated by lawyers on Tuesday ahead of the Wednesday release of the video footage, raises questions about whether officers followed department policy or not. After the public have been suspicious from never seeing any footage to date, from CCTV cameras and video pertaining to the biggest shooting massacre in American history, police now plan to release hundreds of more hours of bodycam footage. Still, this latest footage doesn’t explain or give any motive for Stephen Paddock’s shooting, or even if he acted alone. Clark County Sheriff Joe Lombardo told reporters Tuesday that the footage doesn’t answer why Stephen Paddock committed the shooting. Here below, you can watch the newly released footage in full. The police and FBI have previously stated that 64-year old Stephen Paddock, a former accountant and high stakes video poker player, acted alone. However, Clark County Sheriff Joe Lombardo said that the police investigation is not finished, and many of the population in America, and across the world, immediately after the incident, felt that there was a media cover-up, and that people were not being told the truth about the shooting. Many people even believed that Lombardo was being coerced and forced to stick with a specific narrative after the shooting happened. Lombardo referred to a previous police report on January 19th, which said that Paddock meticulously researched SWAT team tactics, rented hotel rooms overlooking outdoor concerts and investigated potential targets in at least four U.S. cities. The sheriff’s top spokesman, Carla Alston, said on Wednesday that no one in the agency would comment on whether the first police officer through the door of the hotel suite followed the correct procedure by not activating his body camera upon entering the room. The Associated Press and other media outlets have sued to obtain videos, 911 calls, evidence logs and interview reports, so that more video footage will be released. Many people believe that Stephen Paddock definitely didn’t act alone, and that it was inconceivable that he was the only shooter in the massacre, with many witnesses saying they saw gunfire from different locations on the night. Here below you can see CCTV footage of Stephen Paddock bringing bags up to his hotel suite, amongst other videos from Mandalay Bay. It does seem rather strange since Las Vegas has one of the most closely watched CCTV security systems in the whole world, and yet that there isn’t more known about the shooting, or more evidence being divulged to the public. This fact, definitely makes it seem that there is a major cover-up, that the public aren’t being told the truth about the motive of the massacre and all that the authorities really know.